Planning a trip to Patagonia is overwhelming. It's a massive chunk of land: some 1.043 million km² to be exact. This sparsely populated region lies across Argentina and Chile at the southern end of South America, with a mix of Andes mountain landscapes, desert, grasslands and ocean. We spent a month travelling across Chubut, Santa Cruz in Argentina and Torres del Paine in Chile. To help inspire your trip, we've put together our 10 favourite experiences and things to do in Patagonia. Since our travels in the Gobi desert in Mongolia where we got to stay with nomadic families in their yurts, we really wanted to do this again, but in a luxurious way. Staying in a yurt at the Chile Patagonia Camp is a unique and memorable way to experience the Torres del Paine National Park. Located near the entrance of the Torres del Paine National Park by the shores of Lake Toro, the camp is surrounded by spectacular landscapes. The yurts are absolutely lush. They have a private bathroom, comfy king-sized beds and even central heating. You can read more about our yurt glamping experience in our 5 gay friendly hotels to stay in Chile. Also, check out this post about what to pack for a hiking holiday in Patagonia. Punta Tombo on the coast of the Chubut province in Argentina is home to the largest colony of Magellanic penguins in Latin America. They are around half a meter tall and absolutely adorable! Around 1 million Magellanic penguins gather in Punta Tombo between mid-September and mid-April where they come to nest, mate, breed and moult (shed their feathers). Interestingly, between April-September they migrate to the warmer climates in South Brazil, where they stay in the water the entire time, even when sleeping. We spent the day cruising the Argentino Lake with Marpatag to celebrate our 8 year anniversary. And what a treat it was! A boat cruise on the Argentino Lake is a relaxing way to get up close to the glaciers. MarPatag offers all day gourmet cruises, sailing aboard the exclusive Leal Cruiser with a maximum capacity of 28 people. Food on board is delicious, with culinary delights like lamb with peanuts, hummus sauce, figs and onion confit. Lunch is served while the boat is docked, facing the gigantic Spegazzini glacier. You can't beat that for a view! The Perito Moreno Glacier is one of the most popular highlights of Patagonia. This huge ice formation is 35km (22 miles) in length – the size of Buenos Aires city, with a depth of up to 180m (590ft). This was the advice given by our guide to walk uphill on crampons, especially after Sebastien fell flat on his face trying to replicate the dance moves to Let It Go. La Trochita is a steam train that goes from Esquel to Nahuel Pan in the highlands of Chubut in Argentina. It was built in the 1920s to connect the local settlements but was stopped in the 1990s due to lack of profitability. Today, La Trochita has been revived for tourism and is a great way to enjoy the views across the Patagonian steppe. The formal name for this train is the Old Patagonia Express, but it's more colloquially known as La Tochita, which means little gauge. The nickname comes from the small gauges the trains run on, deliberately designed in this way because they were cheaper to produce than normal sized gauges. Sea lion babies are like puppies. They are curious, playful and will steal your heart. 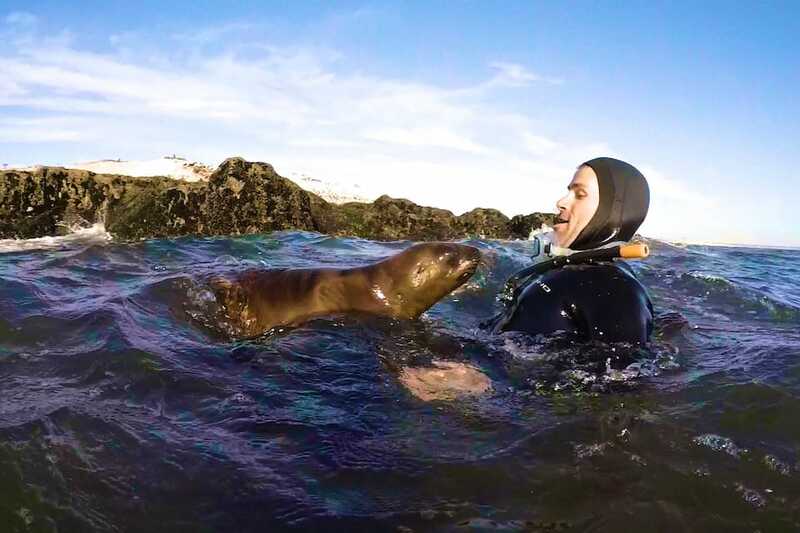 We've previously snorkelled with sea lions in the Galapagos and in Lima, Peru; but at Punta Loma near Puerto Madryn, you can get even closer to them in the water with some even climbing on top of you. This can be done throughout the year, but the ideal time is October to March when the pups are playing in the water and most likely to come and interact with you. We went with Abramar Buceo Aventura in Puerto Madryn, who provided us with all the equipment and also have their own boat to take you to Punta Lomo. Puerto Madryn is one of the most famous places to go in Latin America for whale watching. Between June and December, these 40 ton mammals come here to give birth and look after their newly born calves for a few months before migrating to the colder waters of Antarctica for the rest of the year. The waters around Peninsula Valdes near Puerto Madryn are also prime spots for orcas (killer whales), particularly in January to April and then in October-December when they come to feed on their favourite prey: elephant seal pups. Check out our article about maximising your chances of spotting killer whales in Peninsula Valdes and in addition, our gay guide to Puerto Madryn for the best places to stay, go out and other things to do in and around the city. Everyone talks about doing the W Circuit in Torres del Paine. However, El Chalten in Argentina is another highlight, offering some gorgeous vistas and spectacular landscapes. There are many well-maintained trails in the surrounding mountains of El Chalten, which you can do independently. Our favourite was the 8 hrs circuit to Laguna de Los Tres, just in front of Fitz Roy mountain. As far as trekking experiences go, this one's up there with our Annapurna Circuit trek to Thorong La Pass in Nepal. To find out more, check out our article about trekking in Torres del Paine versus El Chalten. The Chubut province of Argentina is home to one of the largest Welsh communities with 20% of its inhabitants having Welsh blood. This dates back to 1865 when the first Welsh settlers moved here in large waves of emigration, looking for religious freedom. In Chubut, you'll find Welsh settlements in places like Trevelin, Trelew and Gaiman, where Welsh is still spoken, road signs are written in Welsh and the Eisteddfod festival is held every October. Welsh tea is also very popular, with an elaborate spread of sandwiches, jams and different cakes, including the fruity Welsh cake. lamb: in Patagonia, lamb dishes are very popular. We recommend visiting the 25 de Mayo Estancia in El Calafate for a traditional meal where you can also participate in sheep sheering. seafood: the Patagonian coast has delicious seafood, particularly the large juicy langostinos (shrimp), calamar (squid) and prawns in Puerto Madryn. Some of the best seafood restaurants in the city include Nautico Bistro de Mar and En Mis Fuegos. Calafate Pisco Sours: Calafate is a bush that grows in Patagonia and produces a blueberry-like fruit. In Chile, this is the star ingredient for the Calafate Pisco Sour cocktail. Be careful though, it's strong and very easy to drink! Italian comfort foods: Argentina had a strong influx of emigration from Italy over the last century. As such, you will sample some great Italian food here. Our favourite Italian gourmet experience was at Don Chiquino in Esquel. Ditto on Amy’s point about your glacier photo guys; what a surreal shot! I’d love hanging with the penguins, sea lion pups and of course I would enjoy seeing orcas during the proper season. I see Patagonia as one of the world’s little explored, wilderness paradises. I love raw, pristine places where wildlife outnumbers humans. Nothing against humans, as many tend to be my readers LOL. Totally didn’t expect there to be a Welsh village there, how bizarre! 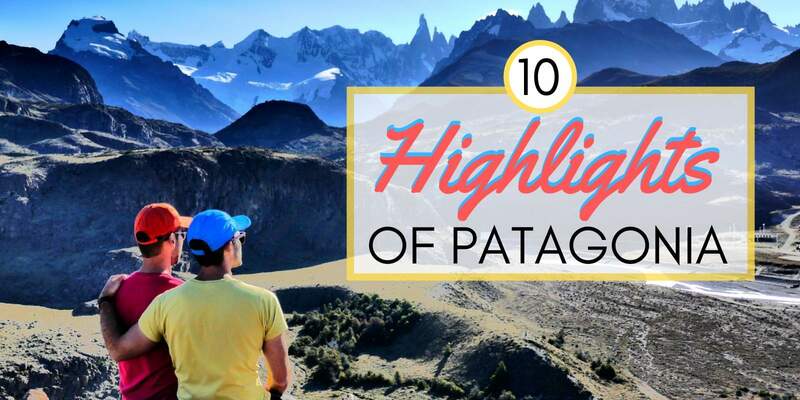 Patagonia looks incredible and it’s definitely on our wishlist for next year. 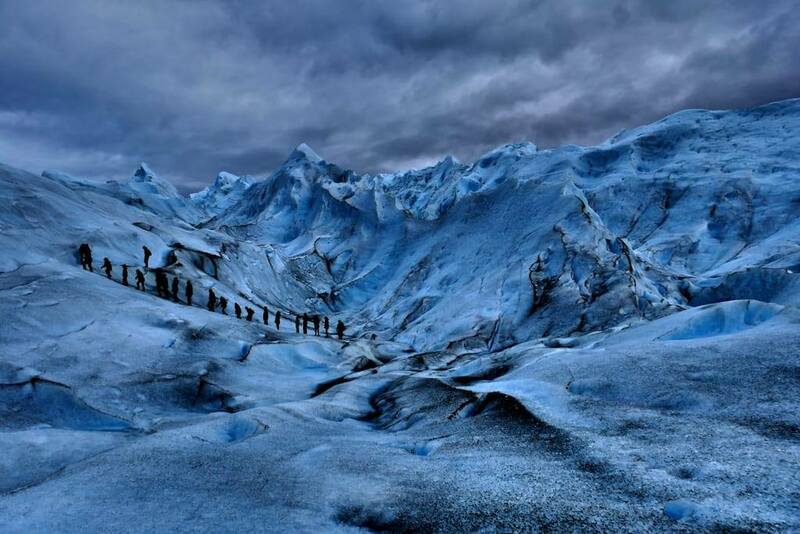 Your glacier pic is awesome, it almost doesn’t look real!